We want your business! We want you to keep coming back for your maintenance and we want you to be comfortable referring your friends and family! Our equipment is state of the art and always updated. Our staff stays up to date on repair by attending workshops and training on a regular basis. Our family lives and shops here locally along with you and your family. 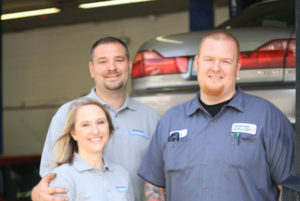 Snohomish Automotive is a full service automotive repair and maintenance center. We are independently owned and operated. We use the latest diagnostic equipment to guarantee your vehicle is repaired and serviced correctly. Owners, Dan and Jody House have two kids. Jody attended Snohomish High School and loves the charm of Snohomish. They are both passionate about changing the stereotype of the automotive industry by providing honest and reliable repair. Our shop mission statement is “To Provide Ethical and Excellent Automotive Repair Service to Our Customers”. Our reputation depends on it.